a shaft furnace for smelting iron in casting production. Until the second half of the 18th century metal for cast-iron production was obtained directly from ore in blast furnaces. Later, small blast furnaces were used to melt cast iron and scrap iron. These furnaces became the prototype of the modern cupola furnace. The emergence of the cupola furnace marked the beginning of cast-iron production without the use of blast furnaces. The modern cupola furnace is a shaft in the form of a vertical steel cylinder with a wall 6-10 mm thick, which is lined on the inside with refractory brick and mounted on a base plate resting on columns. 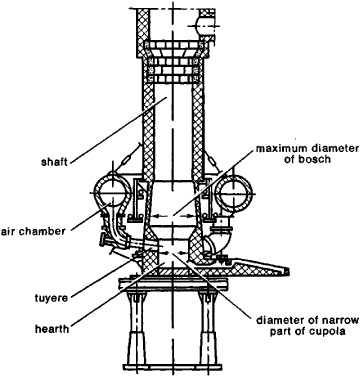 The cupola furnace consists of three basic parts (see Figure 1): the lower part—the hearth, in which the smelted iron is collected; the middle part—the shaft proper, which is fully loaded with charging materials (metal, fuel, and fluxes); and the upper part—the flue, through which the hot cupola gases are fed to the spark arrester and then to the atmosphere. In the center of the base plate there is an opening with a dumping bottom for removal of the residues upon completion of the smelting process. Firing of the cupola furnace begins with the charging onto burning firewood of the first portion of coke (the bed charge), which fills part of the shaft to 0.7-1.0 m above the tuyeres. The blast is started when the coke of the bed charge flares up, and then the shaft is filled up to the charge opening with working beds consisting of portions of metal, fuel, and flux (limestone, basic open-hearth slag, and sometimes fluorspar). After preheating of the charge, the blast is started again and the smelting process begins. New portions are loaded according to the degree of melting of the charging material, which gradually subsides into the melting zone and is heated by the rising hot gases. The counterflow of the remelted materials and the products of combustion in the cupola furnace contributes to more efficient utilization of fuel. The melted and superheated metal accumulates in the cupola crucible or flows into the forehearth, from which the liquid is drawn out as required through the lower tap into buckets for pouring into molds. The fluxes, melting with the fuel ash fused by the lining and oxides, form slag that is discharged through the upper slag hole located in the top part of the cupola hearth or forehearth (not shown in the figure). Cupola furnaces manufactured in the USSR are standardized according to their capacities and are made in diameters of 0.5 to 1.3 m with melting rates of 1, 3, 5, 7, and 10 tons per hour. Cupola furnaces with melting rates of 20-30 tons per hour are also built in shops engaged in lot production of large-scale castings. The main fuel is foundry coke, which is partially replaced by foundry anthracite, thermal anthracite, or coked briquettes. The use of coked briquettes lowers fuel consumption, increases the melting rate of the furnace, and reduces the sulfur content of the iron and improves its quality. The metallic cupola charge consists of foundry cast iron, cast iron scrap, the foundry’s own recovery, steel scrap, and ferroalloys. Air is supplied from a blower under pressures of 5-17 kilonewtons per sq m (500-1,700 mm water column) through the air chamber and the tuyeres to the fuel combustion zone. A system of two or more rows of tuyeres (from four to eight tuyeres in each row), which provides more uniform air-blast distribution according to cupola size, was first developed (by L. M. Marienbakh) and was adopted in industry in the USSR. This decreased fuel consumption by 15-20 percent and increased the cupola melting rate by 25 percent, with simultaneous rise of the metal’s temperature. Preheating and oxygen enrichment of the blast and the addition of gaseous fuel are used in cupola furnaces to intensify the melting process. 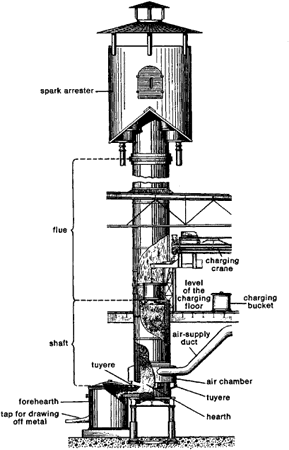 Enriching the blast with oxygen, a proposal made by L. I. Levi and first performed in the USSR in 1944, decreases the specific volume of the products of combustion and raises the temperature of the gases. Depending on the degree of enrichment, fuel consumption is decreased by 30-50 percent, the melting rate of the cupola is increased by 40-80 percent, and the molten iron reaches a temperature of 1500° C (instead of 1300°-1320° C). Partial replacement of the coke by natural gas takes place in the cupola furnace by means of the injection of products of gas combustion into the upper part of the bed charge; this is considerably simpler than blast preheating, and it is economically more efficient. Special gas cupolas that operate only on gaseous fuel and are based on the counterflow of gas and metal, thus allowing stable melting to be carried out over a long period of time, are also used for smelting iron. The melting rate of the cupola varies over a wide range and depends on its dimensions and gas consumption. Owing to the destruction of the refractory lining in the melting zone, cupola furnaces operate for periods of 12 to 18 hours and then undergo routine repairs. Two or three cupola furnaces are operated alternately when daily or 24-hour iron smelting is required. In 1951, N. A. Barinov of the USSR developed continuous-operation water-cooled cupolas for cast iron production, which made possible smelting for periods of 100-120 hours without routine repair of the refractory lining. In order to avoid pollution of the atmosphere by flue dust and exhaust gases, only the construction of so-called enclosed cupola furnaces, equipped with recovery units, dust collectors and gas-purifying devices, and a system of automatic instruments and regulators, is permitted. (The construction of a unified enclosed cupola furnace is shown in Figure 2.) Its distinguishing feature is the blast-furnace profile of the melting zone. These cupola furnaces are manufactured in diameters of 0.7 to 2.1 m, with melting rates of 4.5 to 30 tons per hour. Levi, L. I. Kislorod v vagranochnoi plavke. Moscow, 1952. Chetverukhin, S. I., and A. K. Iudkin. “Unifitsirovannye zakrytye vagranki.” Liteinoe proizvodstvo, 1967, no. 5.